the temperature rise in Greenland. Plants emit compounds to deter pests or attract pollinators, and as a side effect particles are formed when the compounds interact in the air. These particles can contribute to the formation of clouds, which reflect incoming solar radiation, and thus prevent solar heat from reaching the ground and warming it additionally. Researchers from the University of Copenhagen have studied the effect of the imminent climate changes on the release of so-called “biogenic volatiles” to the atmosphere above Greenland. The sensational results are now being published in the prestigious scientific journal Nature Geoscience. The study of biogenic volatile organic compounds (BVOCs) is in itself interesting. They include fragrances, which are released by all organisms, and they are important to the communication between plants and animals, e.g. as a defense mechanism through the repelling of pests. This is well-known in the scientific community, but the possible role of these gasses is less well-known in connection with the arctic climate changes, which are predicted to be more pronounced than elsewhere on the planet. 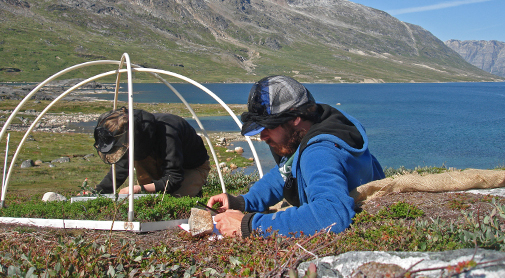 Now, researchers from the Department of Biology and Center for Permafrost (CENPERM) at the University of Copenhagen have studied the biogenic volatiles in Greenland in a climate change context, and the results are sensational. The release of volatiles is known to be sensitive to temperature and light availability. Now the researchers show, that the biogenic volatiles of the arctic areas are much more sensitive to climate changes than previously expected. It all began in 2007. Field experiments were set up in Kobbefjorden near Nuuk - the capital of Greenland - with the purpose of monitoring changes in ecosystems caused by climate changes. In one experiment small open top greenhouses were used to simulate warming of the vegetation. A less debated, nevertheless important, consequence of climate changes is the possible increase in the cloud cover. To mimic the response of the biogenic volatiles to an increased cloud cover, the researchers also put up hessian tents shading the vegetation. And this experiment payed off. “It seems that 3-4 times more biogenic volatiles are released from the tundra upon a two degree temperature rise, when the sun has a free rein. However, when the tundra is in the shade, the release of volatiles is decreased by 70%. Our results show that the release of volatile compounds is extremely sensitive to climate changes. In comparison to other biological processes, such as CO2 release through plant respiration, we discovered that the release of volatile compounds in the Arctic is almost 20 times as sensitive to temperature rise. And that is surprising”. Samples of the volatiles are collected by placing a transparent chamber on top of a little area of tundra. It is the first time researchers have separately measured all ecosystem components. To locate the origin of the effect, the researchers measured on each of the dominant plants, while also surveying the effect on the bare soil. “We show that the warming increases the release from plants, but not from the soil. We also show that the warming has actually reduced plant growth in the area, most likely through drought due to higher evapotranspiration caused by the warming. None the less, the impact on the release of biogenic volatiles was so substantial, that despite the reduction in biomass, we still see a rise for the ecosystem as a whole”. Even though the “shady side” of the story is positive, the “sunny side of the tundra” is negative. “When volatile compounds react in the atmosphere, they impact two different directions. Firstly, they prolong the lifespan of methane, which is an extremely powerful greenhouse gas – 25 times as bad as CO2. Secondly, they stimulate formation and growth of particles in the air, and this cools down the climate. Thanks to the purity of the arctic air, the release of the particle-forming volatiles from the tundra is of particular importance. Cloud formation depends on the presence of particles, on which water condenses, and an increased release of volatile compounds from the tundra leads to the formation of more particles in the atmosphere and perhaps clouds. This can have a large impact on the arctic climate”, Riikka Rinnan points out. Due to the large amounts of ice, the Arctic can influence global climate changes. And if the melting of the Greenland Ice Sheet can be slowed down, it will have a large effect on the climate in the rest of the world.